So first off, so you know where I’m coming from, I’m a web developer. I do some programming, and a minimal amount of graphic design. I’ve got a long term interest in user-interfaces, and did some coursework in designing and testing them in graduate school. I’m no expert in usability, however, and so I’ll mostly be coming at this from a reader’s perspective. The new nook is obviously an attempt at taking a bite out of the cheapest Kindle. 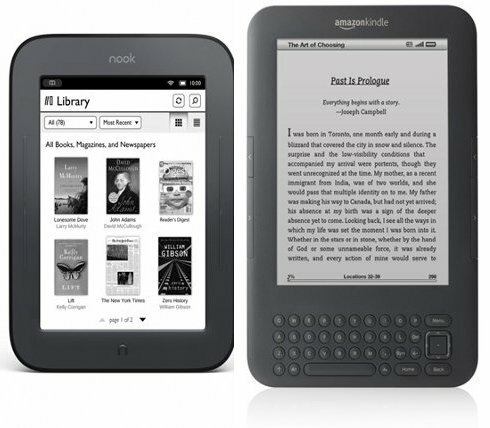 While most nooks are $200 and above, the new nook is $139, just above the cost of the Kindle. Unlike other nooks, it’s black and white, Wi-Fi only, can’t be used as a web browser, and can’t use Android apps. In its favor, it’s got a touchscreen, a total of two buttons on the entire device, claims of a two month battery life, and e-ink screen technology. In short, the new nook is built to do only one thing well — read books. I think it does that. This is mostly because of the touchscreen. All you have to do is click on the right side of the page to go forward, and the left side to go backward. Doing anything other than going forward or backward is done by either clicking on the bottom of the page, or by clicking the “n” below the screen. Clicking the bottom of the page allows you to go to a book’s table of contents, find bookmarks, or get information about a book. 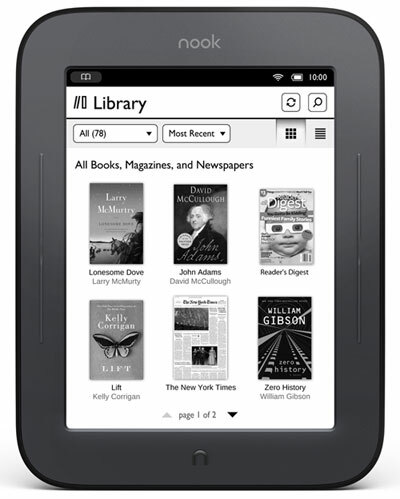 Clicking the “n” allows you to go to your library, change the nook’s settings, or shop for books and magazines. In short, it’s fairly simple and straightforward. The only complaint I have about readbility of the nook is that when you click the page, there’s a moment where you simultaneously see the last page you read and the next one simultaneously. That’s brief, however, and I only noticed it when I was poking around the device, learning where everything was. I barely noticed it at all when actually reading. Outside of reading, there are a couple other things to consider about it–portability and ease of getting books to read. It is portable. It’s small enough to fit in the front pocket of some of my pants. I assume it would fit in a purse though I don’t own one. Turning it on to read isn’t hard (click the “n” and then draw your finger across the bottom of the screen), but it does require enough deliberation that random objects in your pockets or purse probably won’t turn it on and lose your place. It’s constructed out of fairly sturdy plastic. I don’t know how it will hold up in the long run, but it should be okay for normal use. Related to the issue of portability is battery life. The nook claims to last two months. I’m at two weeks in, and have brought the battery down to 50%. I don’t know what they regard as standard usage, but I can imagine that I might use it more than they expect. That being said, I’ve yet to run out of battery life while reading. In fact, it’s still on it’s first charge, so I can’t complain. As for getting books… That’s a twofold question. Buying them from Barnes and Noble is a matter of just a few clicks. They’ve made that quite easy. If like me, you’ve installed the nook reading app on your desktop computer and iPhone, you’ll find that the books appear there too–though the bookmarks you’ve made don’t. Also, unlike the Kindle (and apps), your most recent stopping point in a book doesn’t propagate between your devices. One great thing about the nook as opposed to the Kindle, is that you can borrow books from the library, or at least you can in theory. I mostly use Linux. The application that would allow me to download books from the library only works on Apple OS, and Windows. So YOU can probably get things out of the library, but I haven’t gotten around to installing the necessary program on my Windows computer. Wrapping this up… The new nook works well as a device for reading. If you don’t expect it to be more than that, you’ll be quite happy. It’s similar to reading on an iPhone or iPad in the way that you use the touchscreen to move through the book. It differs in that there’s no color, and the battery life is significantly longer. 1. The new nook has a hidden browser. All you have to do is use the “search” function and you can view web pages. You just have to substitute in the question mark for the period as the “keyboard” that appears when you touch a text area doesn’t include a period for some reason. It’s not a great web browser, but it works. I wouldn’t be surprised if it became fully usable in a software update or some future version of this nook. 2. Transferring books that you’ve got from other sources from your computer to the nook works easily. They appear with your other books. 3. Contrary to what I wrote in the article, I’ve had the page of the book I’m reading be successfully synchronised between the nook and my iPhone. Not sure if it just doesn’t work between the PC and the nook, or if it doesn’t work because I’m running a Windows nook application on Linux with Wine. Jim Zoetewey updates The Legion of Nothing Mondays and Thursdays every week. He’s at Book Two at the moment, and I everyone every last chapter; start reading here.